Taj’s Small Fries Yallingup, is a specialty junior surfing event named after Yallingup resident and international surfing star Taj Burrow. The annual event first started in 2006 and attracts some of the best junior surfing talent in the country to Yallingup in South-West WA. 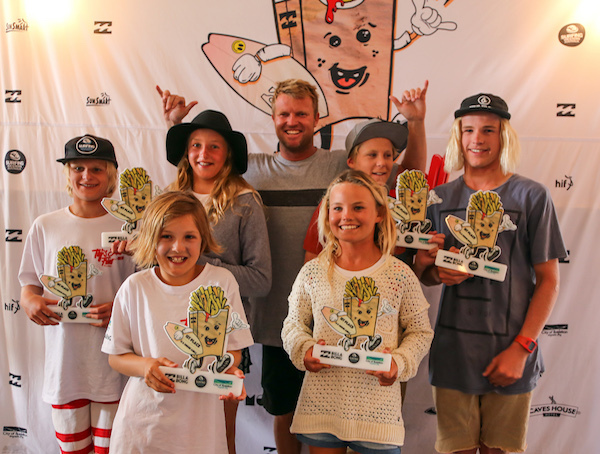 Six new champions have etched their name into Taj’s Small Fries prestigious honor roll, after an exciting finish to the annual event today in Yalligup, Western Australia. After two consecutive days of pumping waves at Honeycombs, a strong southerly change brought about a lumpy and bumpy ocean on finals day. The second stop of the Billabong Bloodlines Series presented by Flight Centre concluded literally in Taj Burrow’s front yard, with wind affected random peaks on offer at the ever-reliable back up locations of Shallows. As the day went on conditions begun to deteriorate, 30 knots of wind and a pulsing ocean meant competitors had to battle hard against the elements to secure their place into the finals. With Taj and Jack Robinson on the beach to watch and commentate the finals, the groms went all out to impress their surfing idols. …The 14 & Under Boys final was an all star shootout, with four of the best surfers of the event all featured. Jed Gradisen (Gracetown, WA) was on fire, using great wave selection and a powerful backhand attack, scoring a near perfect 9.50 (from a possible 10). …The 16 & Under Boys division finished the event with a bang, as Josh Cattlin (Yallingup, WA), Ben Spence (Margaret River, WA), Cyrus Cox (Margaret River, WA) and Jolan Bonelli (Margaret River, WA) went head-to-head in an enthralling battle of the big boys. Showing his knowledge of the Shallows line up, Cattlin picked off the best two waves of the final and blew them to pieces with his great away of forehand turns. Cattlin locked in a heat high 8.50 (from a possible 10) and backed it up with a 7.90 to finish on 16.40 (from a possible 20). Cattlin left Margaret River trio of Ben Spence, Cyrus Cox and Jolan Bonelli to fight for the minor positions. “This is one event I’ve always wanted to win, but never quite achieved it,” said Cattlin. “I’m stoked to put my name on the Small Fries honour roll with all the other great surfers who have won over the years. Caves House hosted the event presentations with a full house on hand to see the winners announced and specialty prizes awarded. Ruby Berry (Margaret River, WA), Koda Killorn (Maroubra, NSW), Seth Van Haeften (Margaret River, WA), Arabelle Gibson (Margaret River, WA), Ben Spence (Margaret River, WA), and April McPherson (Mandurah, WA) all pick up brand new custom Mayhem surfboards for their efforts across the event. 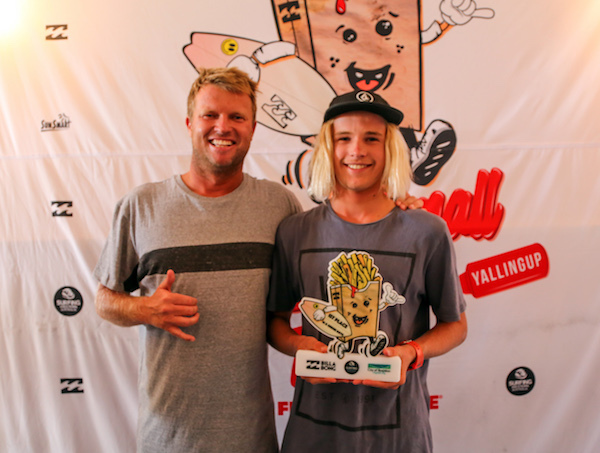 Ben Spence was announced away as the winner of the Future Legends trip thanks to Mentawaii Surf Charters, while Josh Cattlin won the spot on the Surfing World trip later this year. Spectators and competitors are encouraged to interact via Instagram and use the hashtags: #TBSmallFries, #NoTxtNoWrecks. Stay tuned to www.surfingwa.com.au for news, photos and updates relating to the event. Supported by Billabong, The City of Busselton, Surfing Western Australia, The Health Insurance Fund of Australia (HIF), SunSmart, Von Zipper, Globe, Modom, Mayhem, Country Waves,Caves Hotel, Surfing World & Mentawai Surf Charters.